On any given day, a walk in Savannah’s Historic District is an opportunity to take in hidden symbolism from the past. Perhaps one of the most recognizable, not to mention popular, detail is the use of Haint Blue paint. The word haint is old slang meaning ghost. It was commonly used in the region for centuries, derived from the Gullah-Geechee language of the colonial era. The belief in ghosts in Savannah runs strong—very strong—so it’s no strange occurrence to encounter perfectly logical people going out of their way to banish, and/or keep, the lingering dead from their homes. The old belief is that ghosts can’t cross over water, so beginning with the Gullah, the tradition of painting the threshold of their homes in a pale blue paint, almost like a chalk paint, was born. The color was meant to confuse and deter ghosts, and deter Death himself even, by making them believe the residence was covered in, or even beneath water. Over time, the colonists adopted the practice, and Haint’ Blue started to pop up everywhere, from front porches to shutters and even entire interior rooms, such as birthing rooms or children’s rooms, were being coated in the pale blue color. Today, Haint’ Blue is still a popular style choice. Ironically enough, the color has been shown to cut down on the presence of mosquitos and gnats (which can carry around some pretty gnarly diseases - historically, Yellow Fever, for example. Which serves to make the color that much more appealing. The next time you’re strolling Savannah’s Historic District keep an eye out for that pretty blue color - you might be surprised just how often you see it! Similarly, I can’t tell you how often we’re asked about the Dolphin Fish water spouts that dot up and down all along the streets in Savannah’s Historic District. 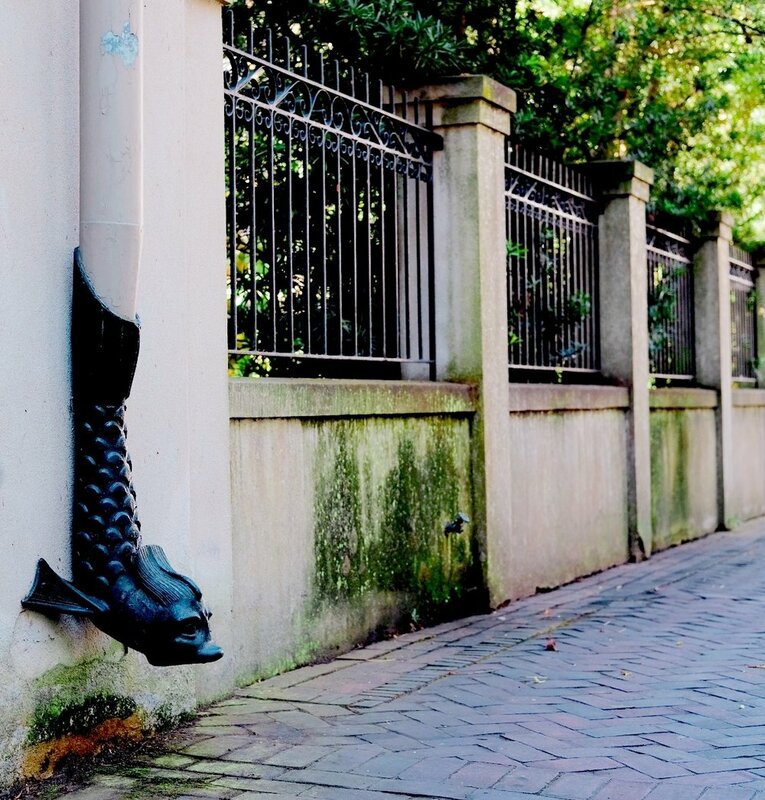 Many of Savannah’s historic homes have these decorative spouts attached to the end of their drain pipes - a tradition which also springs from an old Gullah tradition that dolphin fish are good luck. And because it’s believed that ghosts can’t cross over water, the Dolphin Fish seem to count for double. And Savannah’s quite familiar with those things. A Magnolia Wreath DIY with Table Talk Co.